Are you spending hundreds, if not thousands, of dollars on the newest “it” pill, the hottest “go-to” piece of exercise equipment or the latest new fad diet despite the fact that the only thing that is permanently shrinking is your wallet? Do you still insist on drastically cutting calories and/or eliminating ever-increasing food choices despite poor results – not to mention a bland palate, a splitting headache, bad breath, and a really, really foul mood? Do you yo-yo exercise the same way that you yo-yo diet, with an all-or-nothing attitude that is short-lived, futile and frustrating? Could you perhaps be exercising too much, with little or no comprehension that this is the cause of your ever increasing belly fat, lowered metabolic rate, and decreased bone mass? Or, is the idea of exercising and improving your health a task so daunting and seemingly impossible that you give up in futility and frustration before you ever even have a chance to get started? If you answered “yes” to any one or more of these questions, then you are not alone; and it’s not your fault! We’ve all been led astray by misinformation, bad advice, and a multi-billion dollar marketing industry that wants to sell us something to help fix it. But, will it be sound? Will it be safe? And more importantly, will it work in the long term? Fit, Fat or Just Plain Full of It? not only wades through the many widely held myths about diet and exercise, but also, easily explains why diets really don’t work. 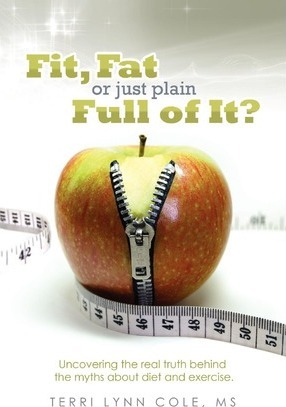 Written by Master’s level Clinical Exercise Physiologist, Terri Lynn Cole, Fit, Fat or Just Plain Full of It? offers realistic, long-term solutions for increasing metabolic rate, getting healthy, keeping fit, and safely managing a realistic weight. After reading this book, you will be able to determine with newfound knowledge and wisdom if the latest gadget, gimmick or guru will get you fit, make you fat, or is just plain full of it!